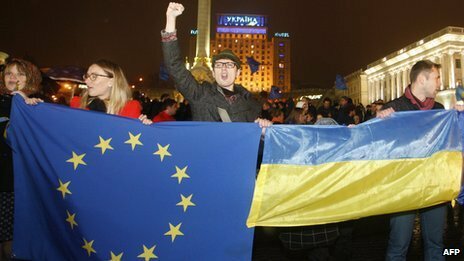 A mass rally has taken place in Kiev following Ukraine’s decision to delay an association agreement with the European Union. Opposition leaders including former world heavyweight boxing champion Vitali Klitschko have joined the protest on Independence Square. Activists are comparing the rally to Ukraine’s 2004 Orange Revolution. They plan to make it a permanent rally. Anti-riot police have been deployed. A Kiev court has ruled that tents must not be erected on the square. In 2004 tents were a big feature of the protests against Viktor Yanukovych, the pro-Moscow presidential candidate whose election was marred by voting abuses. He is in power now and his arch-rival, Yulia Tymoshenko, is in jail. Ukraine came under intense pressure from Russia not to sign the historic EU deal at a summit next week. Ukrainian activists are using social media to mobilise supporters, and on Thursday night opposition demonstrations also took place in the cities of Donetsk, Ivano-Frankovsk, Lutsk, Uzhgorod and Lviv. Ukraine’s PM Mykola Azarov has said the decision not to sign a wide-ranging trade and association agreement with the EU next week was motivated solely by economics and was “tactical”. He said it did not alter Ukraine’s overall development strategy. “The decision to suspend the EU association agreement signing is difficult, but the only one possible in the current economic situation in Ukraine,” Mykola Azarov told parliament. The Ukrainian government said on Thursday that it was instead looking into setting up a joint commission to promote ties between Ukraine, Russia and the EU.